High Peaks Pure Earth has translated a blogpost by Woeser written on August 15, 2013 for the Tibetan service of Radio Free Asia and published on her blog on November 1,2013. Woeser’s piece mainly quotes an unnamed Tibetan environmentalist from eastern Tibet and was posted online in two parts. The below post is the first part only, the second part will be posted separately. In the post, the environmentalist describes their efforts to educate young people about life on the grasslands, particularly those who go to the cities for their schooling. The multitude of issues facing nomads and herders come through in these personal anecdotes, among them their changing lifestyle, the growing generation divide and environmental pollution. The “black tent” is a reference to the yak hair that nomads make their tents from. A friend of mine met a Tibetan from the eastern areas who has been fighting relentlessly for many years for environmental protection in his hometown, they talked about his current project of ecological education and my friend asked me to publish this case here so that more people get a chance to read about it. The Tibetan environmentalist said: “Last year, the children who go to school in the county side or in other places came back home during the summer holidays. I organised an ‘Ecological Youth Camp’. “These children normally have nothing to do after they return home, so they play or watch TV. I grabbed them and gave them a new game to play. I said to them, well you are going to school, and isn’t your tuition fee related to the yaks here?! Everything in your life, your love, your parents, all this is here. When you graduate and work, your parents will still be here, so you should know more about this place, about your homeland. “We would spend 3 days walking around, absorbing everything with our eyes, ears and noses. 4 people in one group, 5 groups in total. People could sign up in the village for a training session. Many people wanted to go but we could only take 20. In fact, not only children going to school outside signed up, those from the village that did not study also came along, they were 13 to 25 years old, girls and boys, all carrying their own tents. Today’s young people have changed a lot, they have tattoos and things like that, so being too traditional, letting them wear old Tibetan dress would be a bad idea. We could walk while listening to music, do anything, it was completely free. 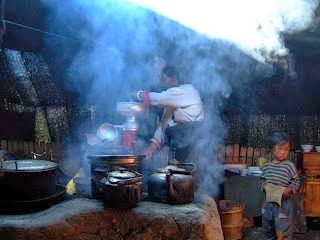 But of course, the food that we would eat on the grasslands would not be Beijing cuisine but our own local food. “On the first day when we set off, I said to those going to school that they would one day return to this place, and to those who are not going to school that they will definitely still live here, so let’s get to know our grasslands a bit better. The young people from the village had quite different views from those in the cities, they didn’t enjoy some flowers here and take some photos there; we city people were more like tourists. As we were walking I asked whether a stone had any religious meaning, whether a mountain had any name. I even gave them the botanical names of grass and flowers. These young people normally don’t pay attention to such things, they don’t even know the names of places, so on the very first day, they said “Wow!” in astonishment that our grasslands are so beautiful. I didn’t present myself as a teacher, I pretended to be an old jumping jack, trying to get rid of the distance between me and them. In the evening we were going to first discuss and debate and then sing and dance, but we never sang or danced, they just kept discussing and debating. “On the second day, we left the grassland and walked along the river to understand what this water really was about. What is in the water? How are our lives related to this water? There is a lot of water here, it comes from the source and runs down, through over one hundred small holes, one of them right here, another one over at the mountaintop; but perhaps the source will one day dry out. We walked for 200 metres, the clear water was full of rubbish, there were hats, underwear, shoes, everything. But one only notices the rubbish when one pays particular attention. Someone shouted, my lord, the water we use for offerings is also this water? The water we use to make milk tea every morning is also this water? We walked along the river, they were building roads there, holes had been dug out everywhere. By the evening we got to the source, no one felt like dancing, how could we sing and dance?! No, we were discussing and debating. “On the third day, we went to the pasture. We didn’t look at the grassland, didn’t look at water, we wanted to look at people! We set up tents, asked how these yak hair tents were made, how they were put up, how one milked those yaks and how one makes butter and cheese etc. It was easy to understand the lives of these shepherds since our parents are all shepherds. Learning proverbs from the herdsmen was also interesting, it was the wisdom accumulated over many many years.